The Romeldale is a breed of sheep developed by A.T. Spencer, who felt the Romney breed would increase the staple, length, and carcass quality of his Rambouillets. Through many years of selection, the Romeldale breed was developed, with fleece properties of 60-64’s, extremely high yield, and uniformity including carcass cutability superior to the other whiteface breeds. During the 1960’s, Glen Eidman, a partner of J.K. Sexton, found in his purebred Romeldale flock a multi-colored ewe lamb. Two years later a ram lamb of the same barred pattern was born and when crossed with the ewe, the resulting offspring were of the same color pattern. Through subsequent breeding and further mutants from the Romeldale flock, the C.V.M. Breed was born. These sheep, christened C.V.M.’s or California Variegated Mutants, were kept by Eidman who then placed emphasis on spinability of the fleece, twinning, and lambing ease. The CVM is classified as a “critical” breed by the American Livestock Breeds Conservancy. There is some debate as to whether these are separate breeds now, or are the same breed with CVM being a color mutation. Regardless, they are fabulous. The Romeldale is a breed of sheep developed by A. T. Spencer. He purchased several New Zealand Romney rams in 1915 that were brought to the Pan-American Exposition in San Francisco. He felt the Romney breed would increase the wool staple, length, and carcass quality of his Rambouillets. Through many years of selection, the Romeldale breed was developed. Selection was made for fleece grade 60-64’s, extremely high yield, uniformity, and carcass cutability superior to the other whiteface breeds. During the 1960’s, Glen Eidman, a partner of J. K. Sexton, found in his purebred Romeldale flock, a multi-colored ewe lamb. Two years later a ram lamb of the same barred pattern was born. When crossed with the ewe, the resulting offspring were of the same color pattern. Through subsequent breeding and further “mutants” from the Romeldale flock, the CVM. breed was born. These sheep, christened CVM.’s or California Variegated Mutants, were kept by Eidman, who then placed emphasis on spinability of the fleece, twinning, and lambing ease. During the 15 years Mr. Eidman spent developing the breed, not a single replacement ewe or ram was sold so that only the highest quality of genetics were used to replace the nucleus. In 1982, the flock was totally dispersed, numbering approximately 75 and selling to over a dozen buyers from throughout the state of California. Since then, the CVM’s have been kept pure in some flocks, while in others they have been crossed with Rambouillets, Lincolns, Polypays, and Suffolks –producing outstanding market lambs! In 1990, The CVM/Romeldale was added to the conservation list of the ALBC (American Livestock Breeds Conservancy). At present, the ALBC lists the breed as “Critical” representing less than 200 annual registrations and less than 2000 animals worldwide. The CVM face is generally free of wool and covered with soft hair, although sometimes wool is found on the forehead. The body is sturdy and well boned with a long straight back. Rams should appear strongly masculine with the ewes conversely feminine. Eyes should be large, clear and alert with ears medium in size. Neck and shoulders should be largely free of skin folds. Legs should be strong, medium in length with pasterns strong and upright. Hooves should be black in color. Sheep should move well with a free and easy walk. Mature rams weigh from 200-275lbs and are determined and virile breeders, able to cover more than the average number of ewes. Ewes weigh from 140-175lbs, are protective, dedicated mothers, prolific and long-lived. Twinning and lambing ease are part of the breed emphasis and if left with the ram, ewes are known to breed while nursing lambs. CVM color patterns vary widely, especially in the darkness of body wool. Unlike many sheep, the CVM will not fade with age, but rather darkens from birth to their first year. With the wide variety of color patterns, including dark grey, black, brown, moorit and spotted, not excluding the barred face badger pattern typical to the original CVM’s a breed description has been difficult. Fleece should be bright, uniform and dense, of high yielding, long staple, fine wool. 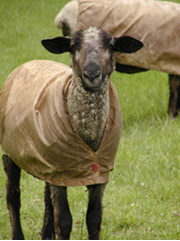 Sheep will average about 8lbs of wool yearly with spinning counts from 60-62’s quality. 12 month staple length averages 3-6 inches. Wool should have a well defined crimp from base to tip, be pliable to the touch and free from kemp or objectionable fibers.